Introduction: Many smaller hospitals do not have specialists that perform ERCP procedures for choledocholithiasis. LCBDE has been shown to be at least as effective and safe when compared to ERCP in clearing the biliary system of stones. Academic medical centers have not been aggressive in training surgeons or developing LCBDE techniques. This area has been delegated to the gastroenterology department. For this reason ERCP has become the dominant method used to remedy choledocholithiasis. My goal is to develop LCBDE methodology that is applicable in any OR with laparoscopic capabilities without the need for ERCP backup or excessive equipment requirements. Methods: The MIG was developed based on thought experiments after experiencing difficulties with available equipment. The device was extruded, fabricated, and packaged and 510 K FDA clearance was obtained based on similarities to prior medical art. In the clinical setting the MIG was used on all cases of choledocholithiasis that presented to our institution. Data were collected concurrently including demographics, stone location, size and number, procedural methodologies used, postoperative complications, serum amylase, operative time and success of stone clearance. Procedures and methods evolved over time as we endeavored to make LCBDE a practical, safe, organized and efficient procedure in a community hospital setting. 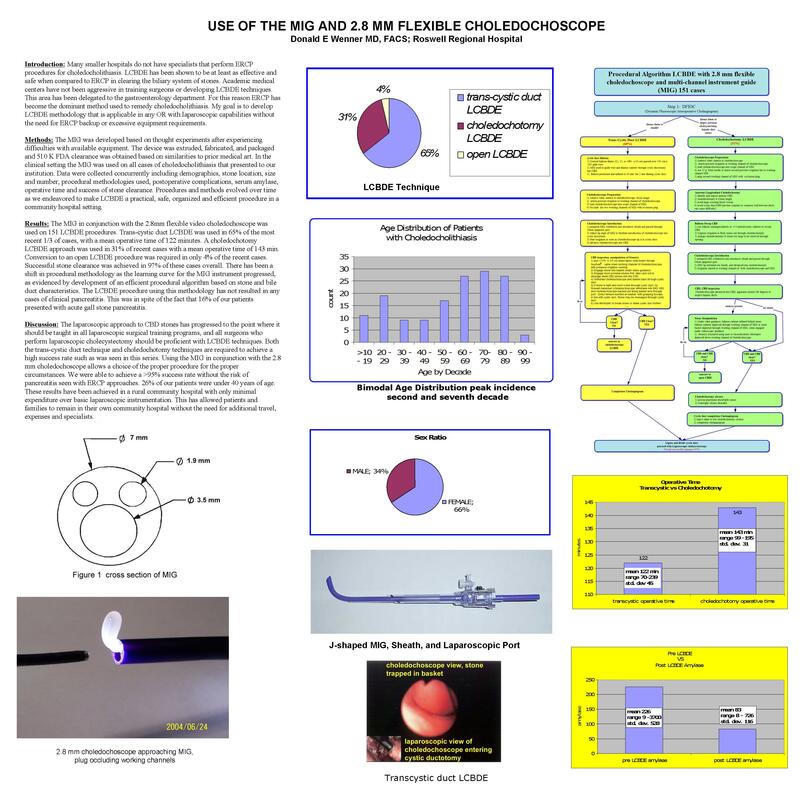 Results: The MIG in conjunction with the 2.8mm flexible video choledochoscope was used on 151 LCBDE procedures. Trans-cystic duct LCBDE was used in 65% of the most recent 1/3 of cases, with a mean operative time of 122 minutes. A choledochotomy LCBDE approach was used in 31% of recent cases with a mean operative time of 143 min. Conversion to an open LCBDE procedure was required in only 4% of the recent cases. Successful stone clearance was achieved in 97% of these cases overall. There has been a shift in procedural methodology as the learning curve for the MIG instrument progressed, as evidenced by development of an efficient procedural algorithm based on stone and bile duct characteristics. The LCBDE procedure using this methodology has not resulted in any cases of clinical pancreatitis. This was in spite of the fact that 16% of our patients presented with acute gall stone pancreatitis. Discussion: The laparoscopic approach to CBD stones has progressed to the point where it should be taught in all laparoscopic surgical training programs, and all surgeons who perform laparoscopic cholecystectomy should be proficient with LCBDE techniques. Both the trans-cystic duct technique and choledochotomy techniques are required to achieve a high success rate such as was seen in this series. Using the MIG in conjunction with the 2.8 mm choledochoscope allows a choice of the proper procedure for the proper circumstances. We were able to achieve a >95% success rate without the risk of pancreatitis seen with ERCP approaches. 26% of our patients were under 40 years of age. These results have been achieved in a rural community hospital with only minimal expenditure over basic laparoscopic instrumentation. This has allowed patients and families to remain in their own community hospital without the need for additional travel, expenses and specialists.